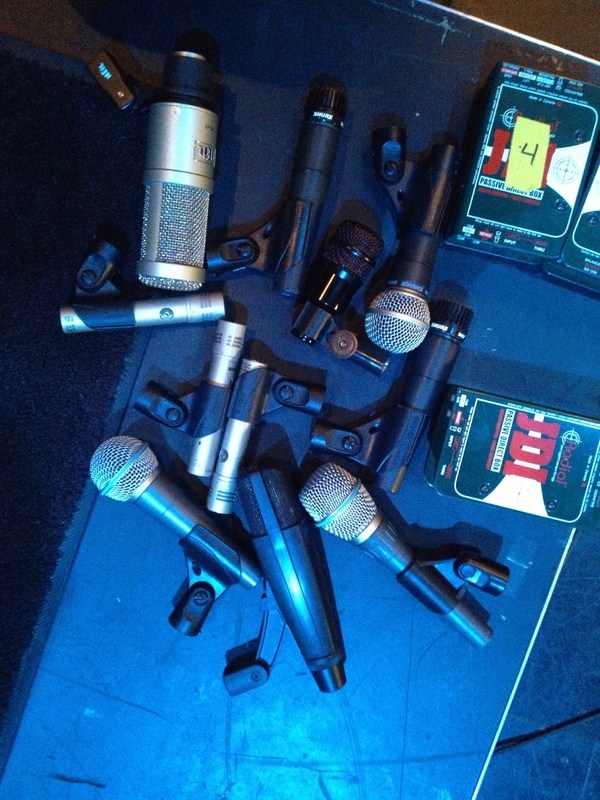 I love pictures of microphones. 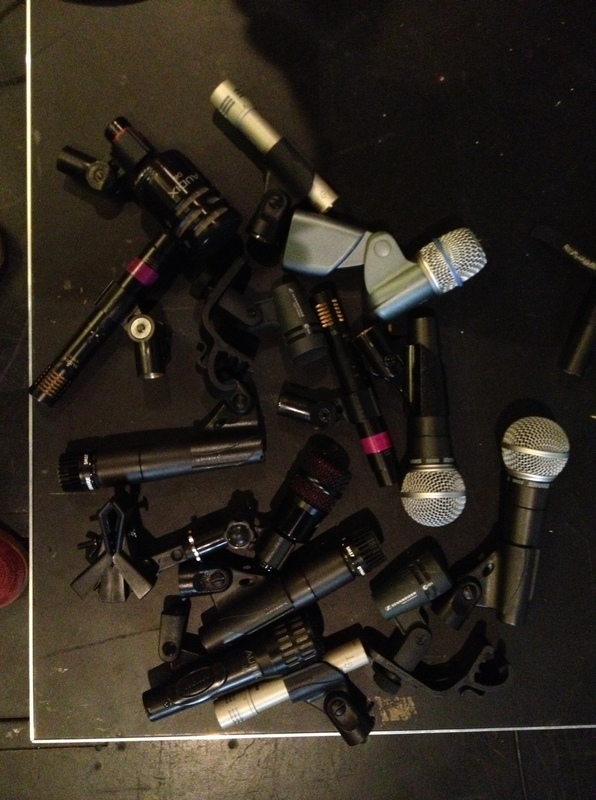 I could browse the web for days just looking at and reading about various mics. There are so many different kinds with a variety of applications and sonic possibilities. 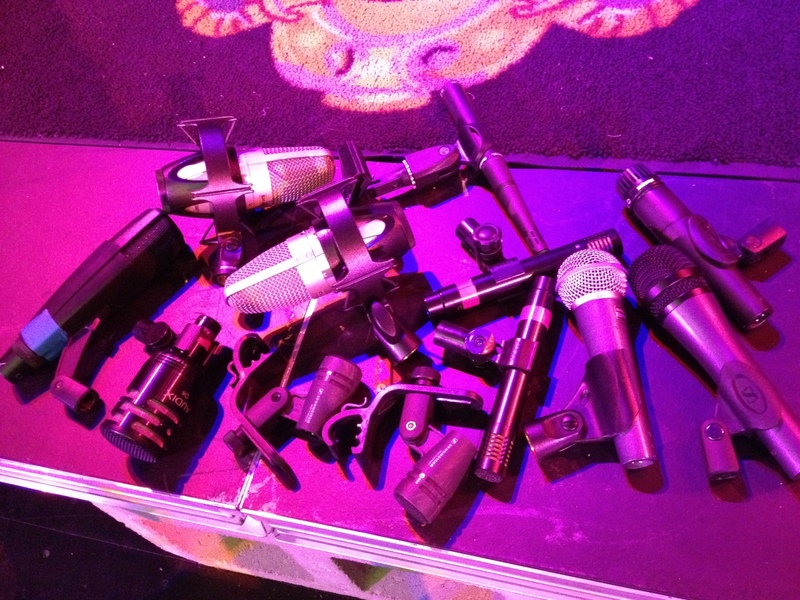 In browsing the photo album on my phone, I realized I have gathered a decent collection of shots featuring collections of microphones I’ve used on assorted gigs. While I wish I had been more consistent in taking these photos and collected pictures from every show I’ve mixed, I would like to showcase a few in today’s post. First up, the photo that started it all. This show was quite some time ago and, as most church bands do, featured a wide variety of instruments and players, so I don’t remember the exact input list. Now let’s look at a photo from Delta Sol Revival playing First Friday Live at the Gillioz Theatre. This package was comprised completely of the Gillioz Theatre’s house inventory, which is obviously all Shure. 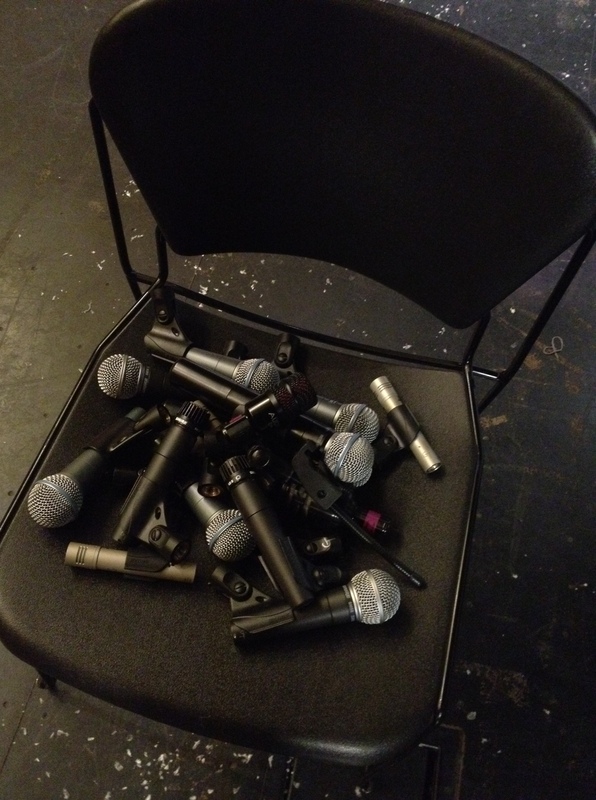 Next up, mics used for J-None’s First Friday Live performance. 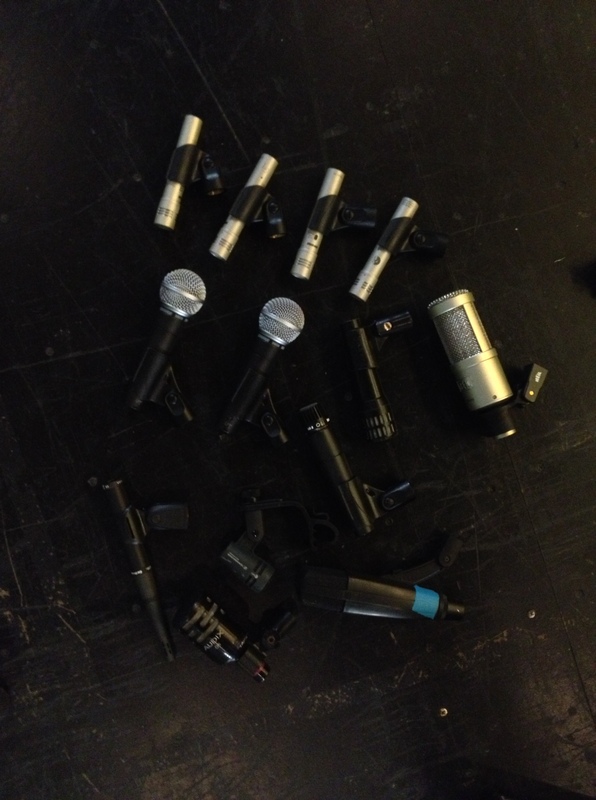 For this show I supplemented some of my own mics to compliment the theatre’s Shure package. You’ll notice I always use the Shure SM57 on snare. I just can’t argue with the results. The KSM27s worked okay on for overheads, but lacked a bit of the pattern control I prefer to create a wide stereo image. The next feature is from one of my personal favorite Springfield, MO bands, The Bootheel. This is when I fell in love the Audix D4 on bass cab. This was also my first time using the Beta 56A for drum vocals, which worked really well as Warren, drummer for the Bootheel, adds a lot to the music with his harmonies, but also hits incredibly hard, which can be difficult to work with in the mix. The Beta 56A provided good rejection of the drum kit and with a little HF rolloff on the console EQ, kept extra cymbal bleed to a minimum. 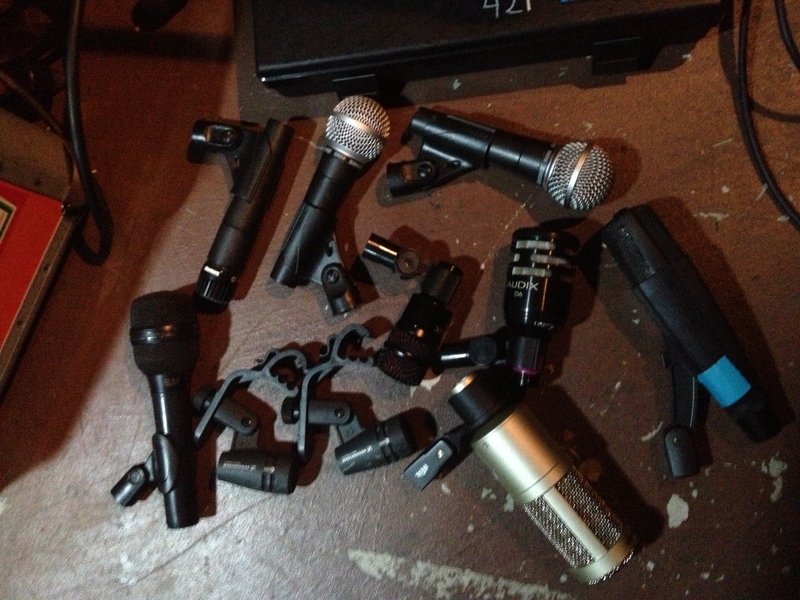 If I could do this again, I’d move the Shure KSM137s to the kit, as I’m not sure I like the ADX51 for overhead use. Moving right along, here is the package used for Someone Still Loves You Boris Yeltsin when they opened for Neon Trees at the Gillioz. For this show, I opted to omit the overheads. As the opening act, SSLYBY was set downstage of the proscenium opening and main drape. I felt there was no need to reinforce the cymbals as I knew the room would take care of that and some bleed would inevitably make it into the vocal channels. This was a great mix–and only 11 channels! I’m a big fan of large-diaphragm dynamics on guitar cabs. The cab on which I used the Heil PR40 is one I had worked with before and was always challenged to keep it from sounding harsh. The PR40 tamed the tone nicely, requiring no console EQ other than a simple high-pass filter. The EV on drum vocals worked beautifully. SSLYBY likes to switch places on stage, moving from instrument to instrument between songs, and when one particular member sings behind the drum kit, it can be quite the challenge to get his vocals to stand out in the mix. He sings softly and plays hard. My dad gave my this N/D857B when I was about 12 years old, and it has been in my collection ever since (honestly, I’d say it started my collection). I had it with my that night and decided to give it a shot. The hyper-cardioid pattern rejected all the stuff I didn’t want and the mic’s response curve worked great for his vocals. My only complaint is that EV no longer makes it. Here we have a photo from Kids & Chemicals playing First Friday Live. Kids & Chemicals is an electronic group backed with live drums. This freed up the resources to go a little crazy on the drum mics, which I am always happy to do. I really liked using the Sennheiser e604 for snare bottom as it required no stand in an already crowded space. The Heil PR40 and Sennheiser MD421 on toms were great. Also, the Earthworks SR20 just feels right on hats–very fast and articulate. Finally, a shot from the last band I mixed at the Gilly, Plaid Dragon. The Beta 87A for lead vocals belongs to Inge, the lead singer, and sounds wonderful on her voice. The D4 helped add some meat to her small, single 10″ guitar amp. 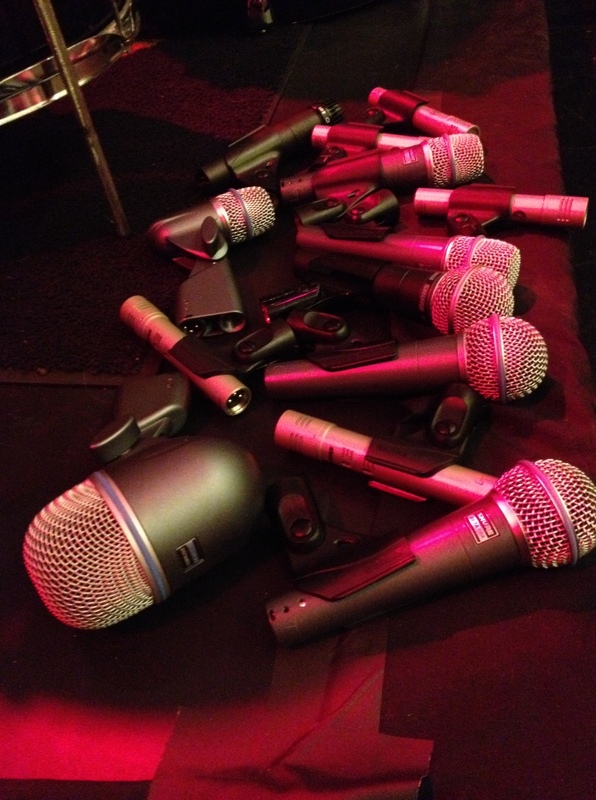 I had owned the PR40 for a while at this point, but had never tried it on kick, which all the studio rats rave about. As you can tell from previous input lists, I’m quite partial to the D6, but Plaid Dragon is a bit “unconventional” so I felt it was an appropriate time to get a little crazy myself. The results were excellent and I look forward to using the PR40 on kick again when appropriate.